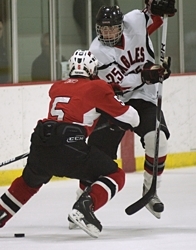 Eden Prairie's David Rath (Photo by Tim Kolehmainen). There are plenty of good games in the Edina Holiday Classic this coming weekend -- which features a round-robin of matchups with Eden Prairie, Edina, Grand Rapids and Elk River -- but this one tops them all. The last two Class AA state champions (Lee Smith's Eden Prairie squad in 2009, Edina in 2010) get together in a game that should tab one as the early favorite this winter. Eden Prairie (3-0-0) is the Hockey Hub's top-ranked team through two weeks, showing an explosive offense that is averaging 7.0 goals per game. The Eagles already have rolled over Apple Valley (6-3), Bloomington Jefferson (8-1) and Lakeville North (7-4), three former Lake Conference rivals. Mr. Hockey favorite Kyle Rau (6-6-12) has been welcomed back with open arms from his "will he/won't he" flirtation with the USHL in late November. Don't take a penalty against the Eagles. Rau and David Rath (5-2-7) have already combined for six power play goals in three games, as the Eagles' power play is humming along at a 70 percent clip (7-for-10). Defenseman Dan Molenaar (0-6-6) quarterbacks the power play and is one of the best at his position in the state, despite his continuing battle with a painful ankle injury. In goal, Andrew Ford (3-0-0, 2.67) is a big-game goaltender who is plenty experienced, as he started the state championship victory as a sophomore two years ago. 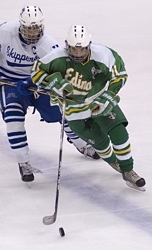 Edina's Lou Nanne (Photo by Tim Kolehmainen). Edina (3-1-0) has already been involved in three one-goal games, all against top-10 competition, winning two (5-4 over Burnsville and 7-6 over Eagan) and losing one (3-2 to Wayzata). They are the kind of early challenges that will prepare coach Curt Giles' team for the postseason. The Hornets are a veteran club, as much of their lineup was on the ice for last year's state title game, including goaltender Connor Girard (2-1-0, 4.33), who came up huge starting every postseason game last winter. Speedy Ben Walker (4-5-9) and Steven Fogarty (5-2-7) are tied for the team lead in goals. Both are among the quickest forwards in the state, as is Michael Sit (1-7-8). Edina also has toughness on defense, as exhibited by Max Everson (1-5-6), who is back after playing for the U.S. National Team Developmental Program in Ann Arbor, Mich., earlier in the fall. This game also is the first between the two new Lake Conference rivals, although this isn't a conference game. Northeastern Minnesota's best rivalry begins a new chapter this coming Thursday as Duluth East travels to Cloquet to take on the Lumberjacks. East has won three of its four games and is scoring an average of 8.0 goals per game. Jake Randolph, who proved to be a playmaker last winter, is showing his scoring prowess this season. After scoring just five goals last year, he already has seven in four games, but his 11 points is tied for second with Dom Toninato (5-6-11) behind Trevor Olson (4-9-13). Cloquet has won three of five and is led in scoring by the trio of Ben Michaud (4-7-11), Jack McFarlane (5-6-11) and East transfer Nolan Meyer (5-4-9). As has been noted before, these two teams have represented Section 8AA for the past 15 years, so a matchup between them usually has great seeding significance. But for Roseau, perhaps even more is on the line. The Rams have started 0-5-0 and are allowing 5.6 goals per game as they search for their defensive identity. Another loss and the season could begin to spiral out of control. Moorhead, meanwhile, has scored just four goals in two games (three by Eric Brenk), but has a win and a tie to show, as the Spuds defense has been very strong in front of Michael Bitzer. The two-time defending Section 7A champion Blue Devils visit the newcomer to the section in Duluth Central. Central's move up to the section only solidified what is arguably the best Class A circuit in the state. Both teams are 3-2-0 thus far, but have come to their records from different places. St. Cloud State recruit Garrett Hendrickson (7-2-9) has scored nearly half of the goals for Virginia, which must get other scorers in order to repeat. Duluth Central is scoring 7.2 goals per game, although most came in back-to-back blowouts against Ashland (Wis.) and Cambridge-Isanti. Colin Magnuson (9-7-16) leads the team in scoring, although eight players have at least three goals already. This one has all the look of the bully on the Section 8A block (Warroad) getting a challenge from the upstart (East Grand Forks) who is tired of putting up with its dominance. Warroad (3-2-0) is coming off a tough weekend on the Iron Range, in which the Warriors lost to both Hibbing and Grand Rapids. Meanwhile, after opening with two losses in which they scored only two goals, the Green Wave (2-2-0) has won two in a row. They have one common opponent, Lake of the Woods. Warroad shut out the Bears (1-0) while East Grand Forks also won, 4-2. Any thoughts that Minnetonka (4-0-0) would suffer early from the loss of its plenthora of Division I graduates has been put to rest with a four-game winning streak to open the season. The defending Section 6AA champions had three straight one-goal wins (Hibbing, Roseau and St. Thomas Academy) before exploding offensively against Chaska. Vinni Lettieri (6-2-8) has been an offensive godsend in his first varsity season, as the son of former Minnesota Kicks' goaltender Tino Lettieri leads the team in goals. Benilde (3-0-0) has perhaps been even more impressive in a start highlighted by a 3-1 victory over Hill-Murray. The Red Knights have great offensive balance. Goaltender Anders Jecha hasn't missed a beat in his first varsity season taking over for Jacob Meyers, as Jecha leads the state in save percentage (.962). All they do is win. Wayzata (6-0-0) has played arguably the toughest schedule in the state thus far and haa escaped with tight one-goal victories over Maple Grove, Edina and Duluth East. The path doesn't get much easier in the coming weeks, either. The line of Tony Cameranesi (4-13-17), Mario Lucia (8-6-14) and Tyler Klein (5-6-11) has been called the best in the state and defenseman D.J. Jones (1-10-11) can certainly add to the offense with his skills. The Trojans are a veteran bunch. Apple Valley (3-1-0) has its own high-scoring trio of Trent Heuer (5-3-8), A.J. Michaelson (6-1-7) and Hudson Fasching (3-3-6). No section implications, nor any conference ones, but this game still gets intense for its bragging rights on the East side of the Twin Cities. Cretin (3-0-1) has picked up more than half its goals from the veteran duo of Bob Kinne (6-4-10) and Tony Barbato (4-3-7), while St. Thomas Academy (1-1-0) is expected to be much more balanced offensively. The Cadets are coming off a 4-3 overtime loss to Minnetonka and may lose their No. 1 ranking in Class A. The two eastern private powerhouses are proud of their tradition and take this game to another level. This is one of a handful of cross-town rivalries that mark the week ahead, but we're featuring this one as the best of the bunch -- largely for a chance to see high-scoring Finnish exchange student Ville Rantanen of West. The senior has an amazing 19 goals in his first five games, which is an outrageous pace of 95 for a 25-game regular season. Other cross-town rivalry games include Bloomington Jefferson at Bloomington Kennedy on Saturday night, Dec. 18, and East Ridge at Woodbury as part of the Suburban East's full day of hockey on Saturday, Dec. 18, at Stillwater. These two teams played for the Mid-State Conference title last winter, with Park Rapids taking the championship. Both teams underwent a bit of turmoil in the offseason, as Park Rapids (1-1-0) merged with Walker-Hackensack-Akeley and Detroit Lakes (4-1-0) had to adjust to the loss of high-scoring Tanner Lane a year early. The Lakers' Nate Baker (10-4-14) is among the top goal-scorers in the state, as he picks up the slack for Lane's departure. Park Rapids suffered through an opening 11-2 loss to East Grand Forks, but the Panthers view that game as an aberration.